Considering I haven't blogged in a while, it may come as a surprise to many of you to hear that Chase will be having another heart catheterization procedure at MUSC later this week. While Chase's special heart is something that is constantly on my mind, it's not something I choose to write about here often, unless of course we have heart-related news to share. Some of you may recall that Chase had what was considered his pre-Fontan cath back in March 2011. The purpose of this cath was to confirm Chase would be a candidate for the Fontan, the third and final scheduled palliative surgery for his congenital heart defect (CHD) called Hypoplastic Left Heart Syndrome (HLHS). 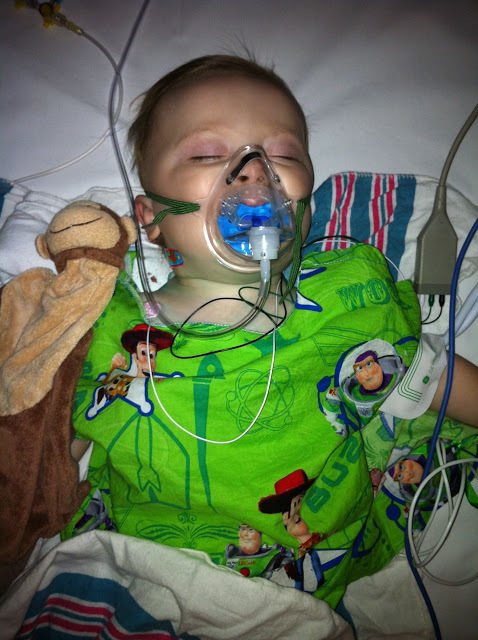 This cath was supposed to be his last/only cath before his third heart surgery. However, almost 2 1/2 years have passed since his last cath procedure, and we (his parents, pediatric cardiologist and surgical team at MUSC Children's Hospital), have all agreed that it would be best to get another peek at his heart before we schedule his Fontan, which will most likely take place next spring. So that means another heart procedure involving general anesthesia and all of the not-so-lovely risks of a heart catheterization procedure. Please keep our little Rock Star Chase in your thoughts and prayers throughout this week as we prepare for his procedure. The last time we went through this he wasn't quite 1 1/2, so it wasn't terribly difficult to care for him since he wasn't able to verbalize his fears, concerns, etc. This time around, we have a very opinionated almost 4-year-old on our hands, who will be VERY aware of what is going on around him and VERY unhappy with all of it. This one is gonna be hard on all of us (none more so than Chase, of course), considering we'll also have our hands full with our little 3 month old while supporting Chase through this procedure. Should be interesting! We're praying he rocks out this procedure and that we don't find any surprises. If you're curious about his previous cath from 2011, you can read about that here. Man, your at the same spot we are. Just this past week our dr said we need to do a per Fontan cath. Gabe had his last one 2 years ago when he was just shy of 2. Now he's about to be 4 and I'm thinking it won't be as smooth as before. I'm also pretty freaked out about the Fontan. We adopted gabe after his second surgery so this will be my first round. I have no idea what to expect or how to prepare. I'm trying to stay calm and just wait for the cath results before thinking about surgery. We have a 6 year old to and I'm worried about her too. I'll be following along with your story and praying for all of you. Kinda nice to know I'm not alone in this preparation stage.